have now been added to the town meeting campaign map!! What about your city or town? Don’t get left out of this epochal movement for racial justice in Massachusetts. 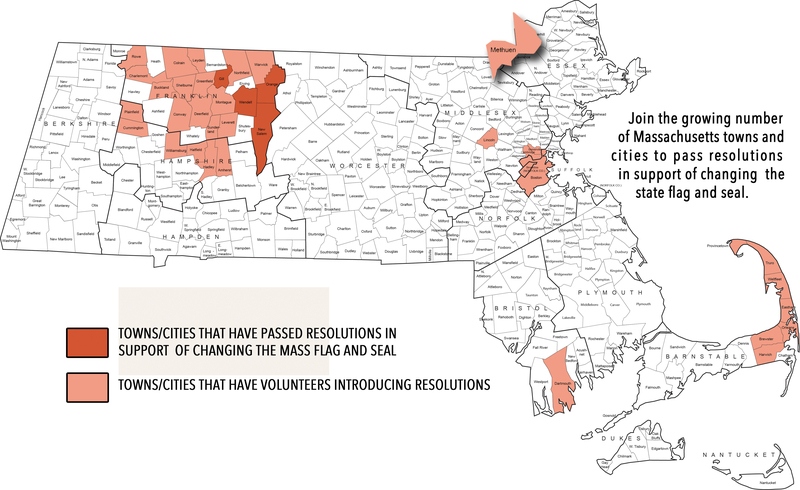 Your town meeting or city council needs to have the opportunity to vote to Change the white supremacist State Flag and Seal of Massachusetts – and you can help! If you gather the signatures of 10 registered voters in your town before the annual town meeting warrant closes – your town will have a strong voice to make positive change in resetting relations with the Native Nations of Massachusetts. No more broadsword over the head of a Native American for our official state symbol. Our third graders should no longer be forced to study this image in social studies classes across the Commonwealth! Help us make the change. Methuen City Council will hear more testimony from the public regarding HD.2968 / SD.1495 – Change the Mass Flag on Monday, February 4th. Supporters are invited to gather in the City Council meeting room on the third floor at 6:45 p.m. Previous New Legislators Coming Out of the Woodwork to Change the Flag! Next Has YOUR State Senator and Representative signed onto the growing list of Co-sponsors to Change the Massachusetts Flag and Seal? If not, CALL THEM before the deadline for Co-sponsors: Friday, February 1st!